Package spice-gtk-0.6 has been rebuilt on Natty to support gobject-introspection.Notice, that it was GTK2 build. Only GTK2 build creates SpiceClientGtk.so,which allows you to open Spice Console via virt-manager. 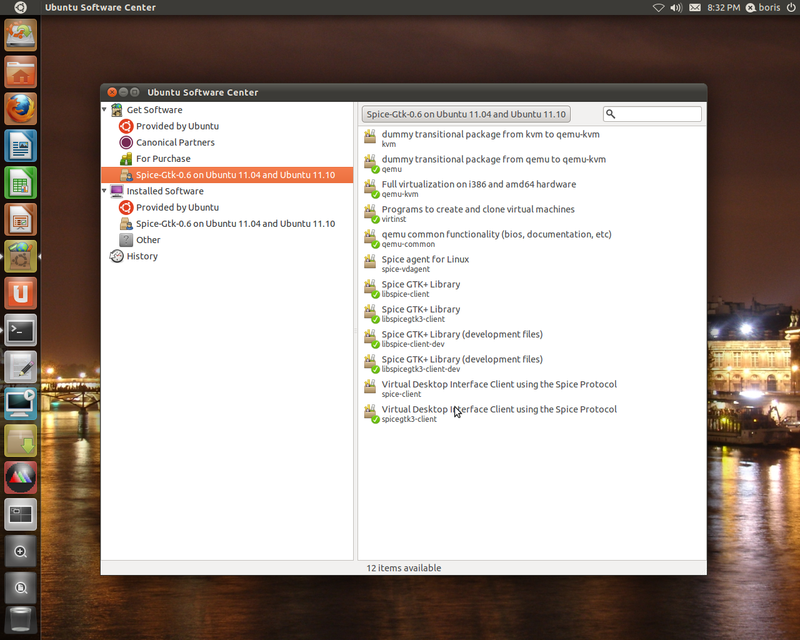 Fedora 16 (rawhide) does two parallel builds GTK2 and GTK3. Analysis of spice-gtk-0.6-1.fc16.src.rpm clearly shows how packages are supposed to be created separating directories with GTK2 and GTK3 shared libraries. Actually, spice-gtk.spec works as a sample to create debian’s package.install files, providing an option reproduce exactly the same file layout on Ubuntu 11.10 as it is on F16 (rawhide) after install package spice-gtk-0.6-1. Just SpiceClientGtk.so allows to run installs with video mode “vga” and spice sessions in “qxl” video mode with created domains via virt-manager. Build spice-gtk3-0.6-3ubuntu9 depends on libspice-client. Both builds have been done for Oneiric and tested to install (with no conflicts) via Synaptic Manager and to work on daily builds 06/24/11 and 06/29/11 . Qemu-kvm build (spice enabled) was based on git clone git://git.kernel.org/pub/scm/virt/kvm/qemu-kvm.git as of 06/23/11. This entry was posted on Tuesday, June 28th, 2011 at 7:57 am and is filed under Uncategorized. You can follow any responses to this entry through the RSS 2.0 feed. You can leave a response, or trackback from your own site. Such clever work and exposure! Keep up the good works guys I’ve incorporated you guys to my own blogroll.